The Kinesiology Department at Iowa State University has partnered with Student Wellness to form a “CydeKicks” peer health coaching program. 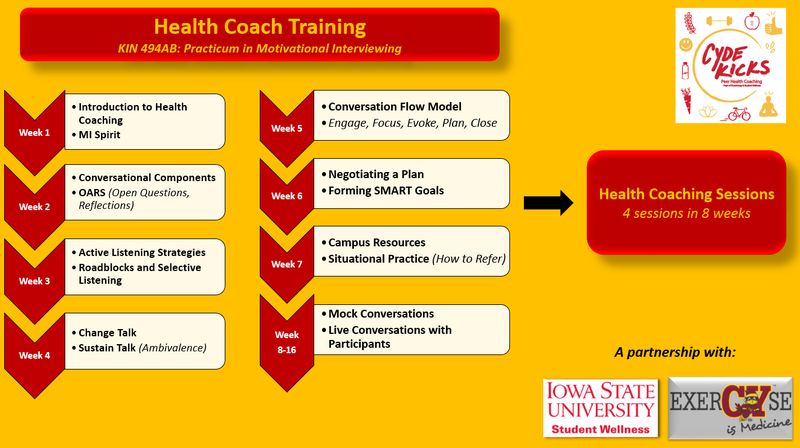 Dr. Laura Ellingson and Dr. Greg Welk have led the initiative to form a Practicum in Motivational Interviewing course as a fulfillment for the new Health Coaching Certificate opportunity offered at ISU. Three trained PhD students instruct the practicum course each semester to train upper level undergraduate students in motivational interviewing techniques. The course is split into two 8-week components where students are trained in the first section, and are then paired to practice their skills with incoming freshman and sophomore ISU students for the second half of the semester. If interested in enrolling in the Practicum course to become a Trained Peer Health Coach, click the button below! If interested in receiving free health coaching sessions as a student at ISU, click the button below to be directed to our sign up page!